The teachings of Kundalini Yoga explain about our times as the start of a profound evolution in human consciousness. This expansion in awareness will continue into the future, during what is called, “The Aquarian Age.” As the dawn of human consciousness awakening takes place there is a resurfacing of ancient truths — an inner alchemy — a merging of divine feminine and divine masculine. A divine union relationship. It’s a co-creative partnership of equality. To embody Divine Union in all its grace and beauty is to partake in the dance of creation. We are all being called to a different standard – a profound acceptance of ourselves as we were created. We are the creativity of the Creator. Every woman participates in the mystery of creation through the cycles of her body, which are connected to the greater rhythms of life, the cycles of the moon and nature. This is felt as a calling to reconnect with the power and wisdom that resides within her, a deep knowing that is not found through external sources but belongs to her very nature. The feminine brings a natural understanding of the totality of life. One of the roles of women is to illuminate a culture that has forgotten the sacredness of the earth and the divine mother, as well as negated the feminine’s deep understanding of the wholeness and interconnectedness of all. The sacred feminine is genderless. It encompasses men and women and both are nourished by her inner and outer presence. Without the divine principle of the feminine nothing new can be born. 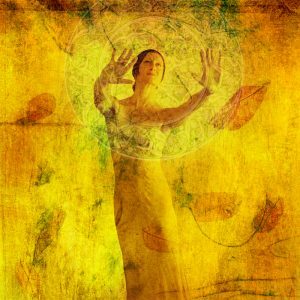 We all need to reclaim the living power and transformative potential of the sacred feminine, to feel the connection to the soul and the earth. A woman’s true beauty comes from within – her inner light. Her radiance. In the words of Yogi Bhajan, The Master of Kundalini Yoga A woman that lives in her divinity and dignity, while continually dwelling in her infinity embodies the quality of the Graceful Woman. She is a gift to the Aquarian Age. Her mantra is I AM A WOMAN. Her identity isn’t rooted in roles or function, or relationships and material security, however beautiful they may be. Instead, her identity is planted deeply in the heart of her True Self and in the hands of Infinity. Aline Lage is the founder of Meaningful Life Spiritual Coaching. 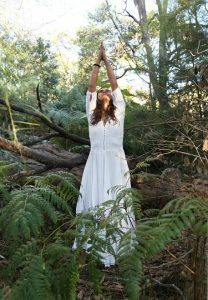 Amongst many areas of study Aline is qualified as a Kundalini Yoga teacher, Gong Master, Energy healer and Life & Spiritual Coach. Aline has found her deepest gratitude for the miracle of life after a near-death experience and the passing of her daughter at birth. She now dedicates her life to helping others to reconnect with their infinite, sacred and divine nature, and the profound meaning to existence. Aline’s passion for empowering women is evident to all who meet her.